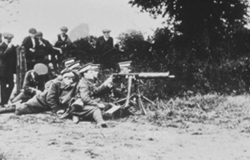 For a couple of months in 1913, the War Office decided it was high time that the modernised British Army was tested. 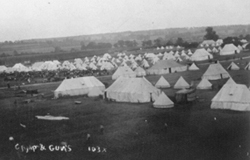 It was agreed that a ‘force’ of 40,000 men should advance from North Bucks to ‘attack’ another ‘force’ near Daventry, to test everything from rifle marksmanship to the working of GHQ. The excitement this caused in the Town can only be imagined, especially among the young boys and teen-aged girls. The boys were particularly interested in the bands, the uniforms and the guns; for the girls, the prospect of many fit, young men in the area was most fascinating. Training was done mainly during the day. There was plenty of marching to military bands, gun practice and other exercises such as putting a pontoon bridge across the River Ouse. There was the occasional night march but, on the whole the troops were free in the evenings.Wolverton made every effort to keep the troops entertained. Dances were organised, choirs gave concerts and smoking concerts were held in the best pubs. In return, the Army organised military displays and concerts. 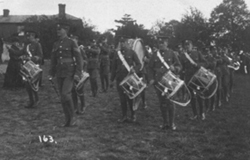 During the manoeuvres, King George V came to Old Stratford to see the troops. There was no announcement about his visit but he brought with him visiting military dignitaries from Europe. The manoeuvres were hailed as a great success by the powers that be. In reality, lots of things went wrong. The roads became very congested, military cyclists refused to leave their bicycles even when they were under attack and co-operation with the 34 available aircraft was sporadic. 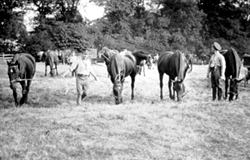 Farmers complained about troops trampling their fields unnecessarily and horses nibbling their haystacks. The great success may be considered to be the friendships that were made and the boys that were made to think that their future lay in an army career.